I love to share what I do and am available to teach classes and workshops. I've taught workshops on Field Sketching and Adobe Creative Suite for adults. I can customize these workshops to specific needs or do something new. I encourage you to get in touch with me. To learn more about my classes for youth see Artists in Schools. Sketching from life, preferably in the field when weather permits, is the heart and soul of my practice as an artist. Spending time outside with your sketchbook is a unique way to interact with the landscape and to study nature. 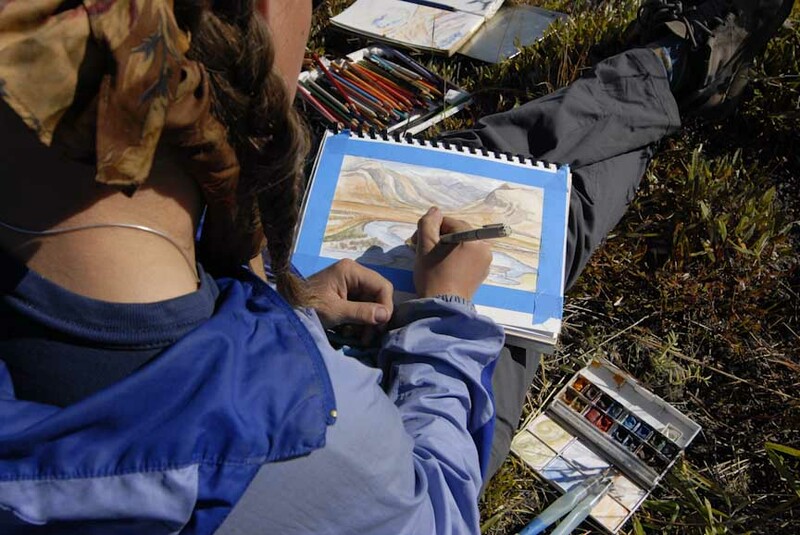 Field sketching is also a wonderful medium for sharpening observation skills and for building a visual vocabulary. A typical workshop covers materials and techniques for working quickly in the field as well as exercises for drawing accurately from life. Students focus on the landscape up close and far away, explore how to tell stories, and keep a journal of informative observations. There is no experience necessary to participate in a field sketching workshop and all levels are welcome.